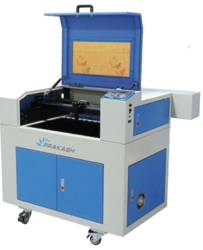 Pioneers in the industry, we offer laser cutting machine, fabric laser engraving machine and non metal laser cutting machine from India. A flourishing enterprise in this domain, engaged in presenting a wide range of Laser Cutting Machine. The provided machine is manufactured using premium quality CNC parts and latest techniques. Additionally, our provided machine is processed adhering to industry standards and quality norms. 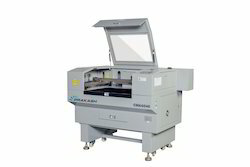 The offered machine is examined on set quality parameter in order to deliver better range to the clients. Also, this machine is made available in various colors, sizes and shapes. Besides, clients can avail the machine from us at cost effective rates. 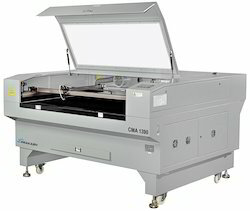 The latest laser technology of FabricLaser Engraving Machine allows clear processing of cutting, engraving and marking. It not only suited to post-processing of large format imposition printed work, but also required in doing short run printing jobs. This machine work as a red light positioning device and show high speed curve cutting. The latest laser technology of Non Metal Laser Cutting Machine allows clear processing of cutting, engraving and marking. It not only suited to post-processing of large format imposition printed work, but also required in doing short run printing jobs. This machine work as a red light positioning device and show high speed curve cutting.